Thierry Meyssan observes the actions that President Trump is taking to convince his allies and partners to drop the jihadists that they support, arm, and supervise. Contrary to the picture painted by the international Press and its political adversaries, for the last four months, the White House has been pursuing an anti-imperialist policy which is beginning to bear fruit: the process of the cessation of Saudi support for the Muslim Brotherhood, the end of the coordination of the jihadists by NATO, and the process of the cessation of Western financing of the Muslim Brotherhood. Although NATO was conceived to protect the West against the Soviet Union, Donald Trump has redirected it. While it maintains the goal of rivalling with Russia, it will now dedicate half of its means to the fight against jihadism. From the 3rd conference of the Friends of Syria, on 6 July 2012 in Paris, to the investiture of President Trump, on 21 January 2017 in Washington, the United States, France and the United Kingdom never ceased organising the war against Syria, while constantly pretending to be negotiating a political resolution. Over the last 16 years, and particularly during his Presidential electoral campaign, Donald Trump has presented himself as a militant anti-imperialist. Contrary to what is claimed by his detractors, the fact that he is a billionaire in no way compromises his political convictions. Since he arrived at the White House , President Trump has had to fight against his own administration, of which 98% of the senior civil servants voted Hillary Clinton, and also against the allied governments of his predecessor. So, over the last four months, he has continued to follow his desire to liberate his country and the world by instigating a series of actions which his adversaries either deform or present as contradictory. During the Summit of the Arabo-Muslim States, on 21 May in Riyadh, Donald Trump appealed to his interlocutors in general and Saudi Arabia in particular to break off all contacts with the Muslim Brotherhood and to sever all ties with Islamic terrorism . Aware that he was asking King Salman to give up his main army, he gifted him with a replacement arsenal worth 110 billion dollars. Despite the bursts of generosity of the King and his court, at the end of the summit, Saudi Arabia published a declaration without prior approval by the other participants . This document may be read as the announcement of the creation of an « Islamic Military Coalition », an expansion of the « Joint Arab Forces » whom we saw at work in Yemen. But it may also serve later as a justification for Saudi occupation of regions of Syria, Iraq and elsewhere which had been liberated by Daesh. 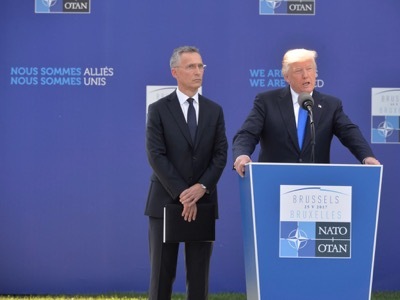 At the Nato summit, on 25 May in Brussels, Donald Trump invited his allies to offer a minute of silence before a fragment of the Berlin Wall and a piece of débris from the Twin Towers. Reminding them that they had accepted – in the name of Article 5 of the Treaty – the principle of the fight against terrorism during the attacks of 9/11, he obliged them to redirect the aims of the Alliance . It will of course maintain its anti-Russian function, but is now dedicated to the eradication of the jihadists which it has so far been coordinating from the base at Izmir (Turkey). As well as this, he compelled them to share their information concerning terrorist organisations via a Coordinated Intelligence Cell. At the G7 Summit in Taormina, 26 May, Donald Trump managed to strong-arm his allies into making a declaration « against terrorism and violent extremism » . In reality, his partners only accepted the agreement in order to prevent the spilling over of terrorism to the West from the areas where they organise it, finance it and supervise it. In any case, the G7 began a process aimed at drying up not only the financing of terrorism, but also that of violent extremism, in other words the Muslim Brotherhood, the source of terrorism. This declaration was only possible in the context of the attack in Manchester perpetrated on 22 May, by the son of an M16 double agent, both an ex-member of Mouamar Kadhafi’s security services and of Al-Qaïda . But it is clear that the British still have no intention of depriving themselves of the Muslim Brotherhood. However, it does seem possible that France and Germany are beginning to clean up their services. It will take them a while. Donald Trump has still not been able to do so in his own administration. Thus, on 20 May in Jeddah, the Pentagon delivered arms to the jihadists,honouring a contract signed in the final days of the Presidential transition . These new weapons include multiple rocket-launchers and Bulgarian OT-64 SKOT tanks. How is the War on Terror being used for Power Projection? Similarly, during its first international visit after the inauguration to Saudi Arabia last week, the Trump Administration has signed arms deals worth $110 billion, and over 10 years, total sales would reach $350 billion. 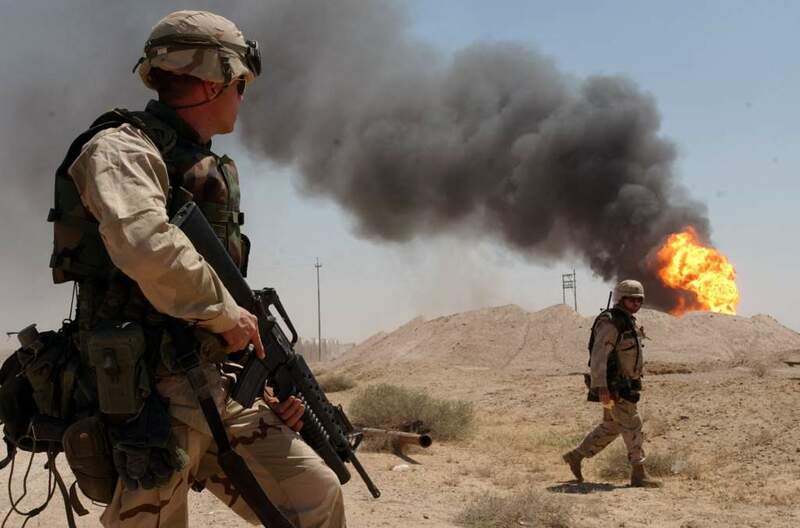 More to the point, it is only a “coincidence” that Iraq has 150 billion barrels of proven crude oil reserves and has the capacity to produce 5 million barrels of oil per day, while Libya has 45 billion barrels reserves and it used to produce 1.6 million barrels per day before the civil war. Regarding the Pax Americana which is the reality of the contemporary global political and economic order, according to a recent infographic  by the New York Times, 210,000 US military personnel are currently stationed all over the world; including 79,000 in Europe, 45,000 in Japan, 28,500 in South Korea and 36,000 in the Middle East. By comparison, the number of US troops in Afghanistan is only 8,500 which is regarded as an occupied country. Thus, all the European, Far Eastern and Middle Eastern states mentioned in this list are not sovereign states but the virtual colonies of the US.